"Found no video players that supports the given video format." The video is not private and can be embedded anywhere. I've tried other Vimeo videos as well and they don't work. YouTube videos are working, but all my stuff is on Vimeo. I'm sorry, H5P does not currently support vimeo links as a format. You would have to provide a direct link to the video which I believe requires Vimeo pro. You can read more about it in the Vimeo support thread. Yes I've got Vimeo Pro. Please advise how to do this. The thread you mentioned doesn't have the solution. In Vimeo, go to Video Settings and select Video File. Copy the direct link from the High Def box. Note that using the URL in the address bar will NOT work. Great that you got it working. Thanks for the info. Do subtitles added to vimeo appear on the interactive player as well? Or do you know if you can add them in the player directly (and whether this works using a vimeo link? Thanks very much in advance in advance. Subtitles must be added under the Text tracks section after adding the video. Currently, they can only be uploaded. I have the same problem vith Vimeo video - could you please make a screenshot or specify, how to get this video file link under video settings? I simply cannot find the right place. I'm sorry, but it appears that Vimeo have completely changed their Upload page since I posted the solution almost 2 years ago. I cannot find where it is either. If you do find it, could you please post it here? Have you had a look at our documentation page? Or is that outdated as well? Great that you found a solution for Vimeo. Could you post a screenshot what link in what Vimeo page has to be copied exaxtly. I was not able to find the right one while I was searching for a longer time. I believe you must have Vimeo Pro in order to use other video players. I have just tried the above on Vimeo pro in Column and Course presentation formats. 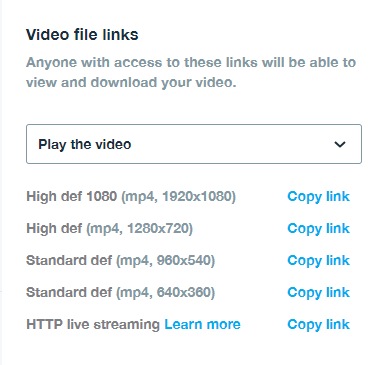 It should be underlined that links from the Video settings allow anyone viewing the video can download it or copy the link to access it directly. This is an issue for us as a school. As of now, embedding the video seems to be the only way to respect our students' privacy and copyright. If anyone has a workaround this, it would be great. Can you not set it as a private video? You can specify what website you want it displayed on. If you embed, yes, that works out, but then you can't embedd a video into Course presentation or column for example. Unless I have missed something crucial!! BUt as vimeo mentions those special links override privacy settings and anyone with the link can access and download the video. We are experiencing the same problem. We are using Vimeo Pro as a Video streaming provider and a H5P Column as content. 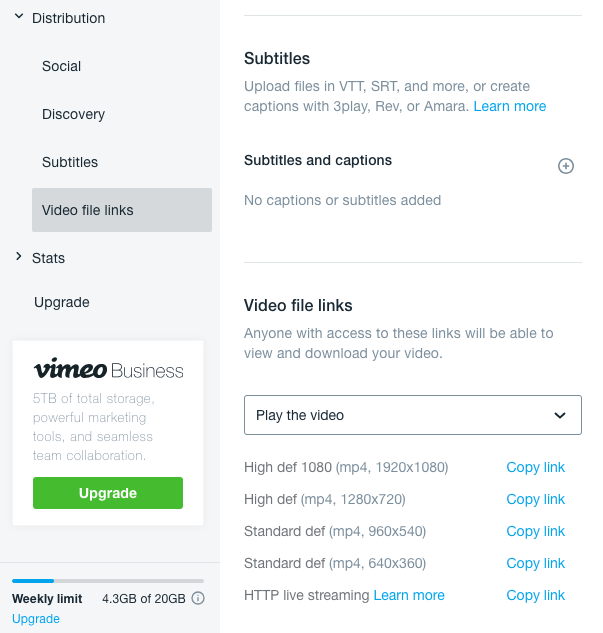 Now we have the situation that anyone can just download all the video’s and we can not embed the Vimeo video in any way while using the Column. Is there any solution to make the video’s available but not downloadable? Just disabling the download button, would be great! Ok, found a solution to hide the download button. I tested it in our site, made it work by adding some CSS to the H5P CSS file. Hi b.harkink, I feel that for the majority of users having the download button would be desriable. If some wish to hide it they can modify their H5P's as you have. This screenshot might help if you're looking for the direct links on Vimeo. Thanks for helping out! We have created some documentation on how to include vimeo videos meanwhile, but it was you who actually found that this issue was still not resolved properly here. Thanks a lot! Thanks for the info. The integration in H5P works a little different anyway. We don't use GET-parameters, but the iframe-PlayerAPI that has different features. Thank you for the information this will definitely help a lot in the community.